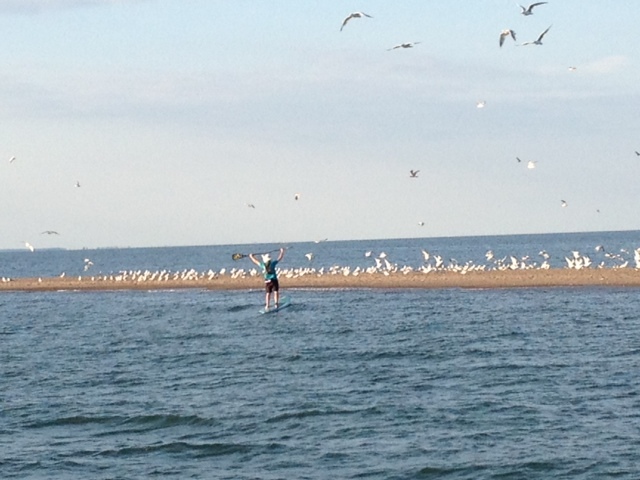 On August 15th, 2013 I was proud to make the first stand up paddle crossing of Western Lake Erie. I paddled 35 miles in 12 hours. My route was from Bay Point, OH to Point Pelee,Canada. I was blessed with great weather with temps in the low 70′s and a warm lake temp of 70 degrees. Another blessing was the great boat support crew of my girlfiend Jaime, Captain Stacy Acker and her friend Cherl. 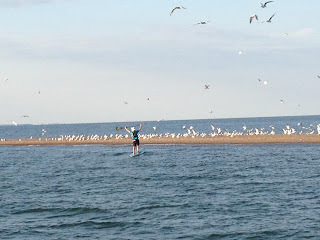 I joined Canadians Tom Comet and Jonah Logan as the only ones to cross Lake Erie on SUP’s. Last fall they paddled 33 miles across eastern Lake Erie from Long Point, Ontario to Erie. This paddle boarding journey benefit would not be possible without the following sponsors: Avex, Glide, Beyond Coastal Sun Care, Zenergy at Thundersprings Spa and Club, Mammut, Chums, Smith Optics and the Cleveland Coffee Company. For this adventure I used some new Mammut gear! The MTR141 Shorts worked great. They are super comfortable, light weight and dry super fast. I also used the the MTR 201 for my hydration pack. This pack is the lightest in the world!